I’ve griped forever about how there isn’t a good Mexican “sit down” restaurant in the Hamptons. I’ve complained and complained. Yes, I like La Fondita and Sabrosa but I can’t really see having a nice quiet dinner at either location. But this summer, it seems we finally can get the whole enchilada and enjoy it too! First in Southampton is Union Cantina. Located at the site of the former Southampton Public House, the “Cantina” opened in mid-June and has been packing it’s tables ever since. So far, the reviews have been pretty good. I haven’t yet been but FOHC (Friends of Hamptons Chatter) have been telling me the foods pretty solid… not outstanding but good. The standouts according to my sources are the enchiladas, roasted peach glazed pork and the freshly made salsa. While the prices are certainly not Taco Bell they’re not exactly Nello either. So based on the word of mouth around town it seems Union Cantina is worth a visit. If you’ve been, let me know what you think. Secondly, The Blue Parrot in East Hampton has long been a punch line for bad food and bad service in my book forever! I went a few years ago when it first opened under the new management which includes Jon Bon Jovi and the girl from Jerry Maguire who has a name I can’t spell. The food was overpriced, lousy and served with a snarl from the surly staff. If that wasn’t bad enough they used to have a bouncer there which would have lead you to believe, folks were clamoring to get inside…. and they weren’t. Anyway, for whatever reason I decided to stop by for a visit last week after a hiatus of close to three years. The first thing I encountered was a friendly staff and no bouncer! I had to wait while my table was being prepped so I sat at the bar and had a really great margarita… at $15 bucks it was no bargain but the pour was generous and the mason jar/drinking glass was filled pretty high. I’m sorry… I’m sorry… I like you!!! After about 5 minutes, the table was ready and I sat down as fresh tortilla chips and salsa were being dropped off at the table. That was followed by the house Oaxaca salad and Lime Chipotle fajitas. While I know fajitas aren’t exactly gourmet and probably not the best way to judge the cuisine, I have to say they were really good and served with fresh made corn tortillas. By the way, yes you can make bad fajitas I should know, I worked at a Chi Chi’s in college (for those of you who don’t know, it was the Mexican Olive Garden of the 80’s). My partner in crime Peter had the fish tacos which which also garnered a big thumbs up. The final verdict is that I take back all the negative things I’ve said in the past about Blue Parrot. The snarky Go Fund Me page for the chef to take cooking lessons has been taken down and my mea culpa is complete. So , if you’ve not been to The Blue Parrot in years, take my advice and give it another shot. Finally, just in time for August some good news about what makes the Hamptons such a fun place to live. According to sources, billionaire investor George Soros made a stop with a few friends at the American Hotel in Sag Harbor. While that’s not anything to set rumors flying what happened when the check was delivered is the interesting part. Apparently Mr. S. (as I call him) paid his hefty check with 4 figures not including cents and added on a 100%+ tip for the staff. While I haven’t been able to confirm this Christmas come early gift from the tight lipped staff at the hotel… my sources are pretty reliable. Besides, what’s so wrong with being nice!? A Toast for Tacos…. Plus, Hamptons Hostility 2014! Well traffic is terrible, temperatures and tempers are rising and the Hamptons is now entering into what I affectionally call “Seasonus Horribus.” But while some folks find this time of year a bit challenging others relish in the chaos. Yes, there are folks who miss the city and are pining away… and not the kind with sap… for a little hostility and confrontation. Yes, it’s the 2014 edition of Hamptons Hostility!!! The top 5 places where you can be as nasty as you want to be and where a middle finger is just another way of saying hello! So here in my humble opinion, are the top five nastiest locations for this year…. 1) 7-11 Manorville – While technically not in the Hamptons, it’s definitely a ritual stop for more than a few city dwellers on their way out east. My experience involved the doubling of coffee cups and the managers instance that I pay and additional $0.50! “But sir, the sleeve doesn’t prevent the cup from getting crushed in the cars cup holder.” So, while the manager didn’t care for my explanation and threw me more attitude than Lizzy Grubman in a parking lot (you would have thought I dropped a 2 gallon Big Gulp on the floor) I left both cups on his counter. Fifty cents for an extra cup, really?! That is extortion in my opinion and not nice. I’m now doing my stops at the Cumberland Farms. 2) The intersection of CR39A and Rt 27! – The place where allowing a car to merge in front of you is as welcome as a root canal or IRS audit! It’s also totally racist where German sedans have no tolerance for American hybrids or trucks (and vice versa). I could tell you the way to avoid this area but why would I want to ruin my good thing!!! Yes, I know this is the one in Riverhead! 3) CVS Pharmacy (Southampton & East Hampton) – It’s the Motor Vehicles of pharmacies! While I have no complaints about the general staff, you know the human cashiers etc. The pharmacy has long lines and an indifferent staff that really gets annoyed with questions. But if that wasn’t enough, try to deal with their automated phone system! Lord help you if you need an Epi pen in a hurry! 4) Cavinola’s Cheese Shop (Sag Harbor)- Yes, apparently Ina Garten thinks this shop is the big cheese.. but I think it’s more tres fromage! The selection is actually extensive and good but please don’t dare question the prices. When I made the mistake of grimacing at one particular price, I got an annoyed response of “then don’t buy it.” Wow, that was nice! So guess what… I didn’t …..and that cheese stood alone! I then took a quick trip to Schivoni’s who also has a great selection for a fraction of the price! I mean, I shop at Round Swamp Farm so I’m not afraid of prices but at least be friendly! What do I need to bring a camera crew!? 5) Nick & Toni’s (the bar) – This is not about the restaurant or the employees. It’s about the patrons who sit at the bar. If you spend any time in the Hamptons there are going to be nights when nobody is around and you want to go out and mingle and have some dinner. Well if you’re sitting at the bar at N&T’s bring a book. The atmosphere there is so chilly you’ll feel like a Kardashian walking into the Maidstone Club. But hey, sometimes you wanna go where (signing the “Cheers” theme) “nobody wants to know your name. Honorable Mention: Rushmeyer’s in Montauk. The perfect place to hang if you’re going out on daddy’s credit card. It’s like “Logan’s Run” meets the Hamptons. “Pete’s Endless Summer Taco Shop” is a welcome addition to east end cuisine. The menu which features his famous fish tacos, along with such delicacies as braised duck, nori brined applewood barbecue chicken (which blew me away… really good) and vegan selections is fairly basic but full of gourmet varieties of the Mexican treats. There are no fajitas or burritos on the menus but there’s plenty here to choose from and at a really reasonable prices, especially for the Hamptons. Prices start at $5 per taco or 3 for $13-$16 and make this easy to go down. Fries, salads, fresh guacamole and home made grilled tomato salsa are also available. If you want more information go to www.peterambrose.com or call them at 631-527-5515. Pete’s Endless Taco Shop is located at 283 Pantigo Road, East Hampton. Also make sure to try the deserts from Jennifer Corzzo… delicious! Random Musings Vol 1. 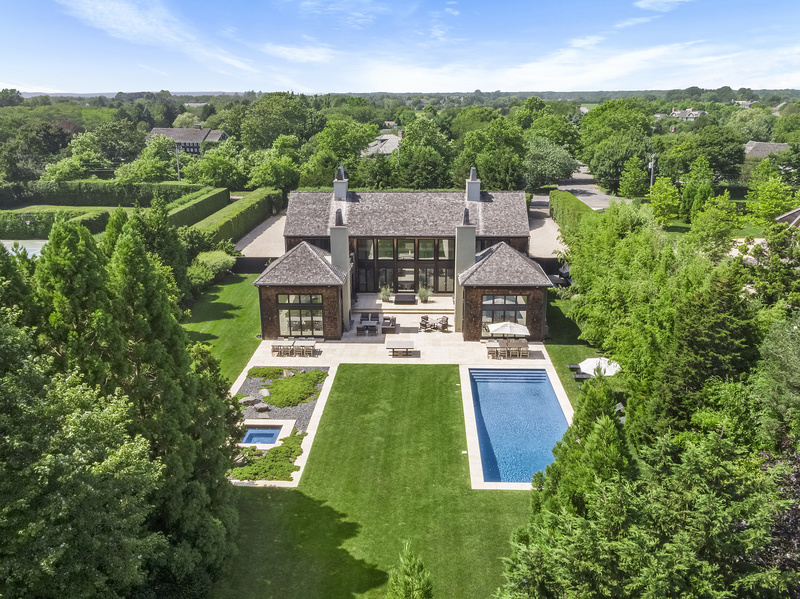 .. Cinco De Mayo, Subway and A Senior Project Sells in East Hampton! Sometimes, there’s a lot going on in the Hamptons. This week is no exception. So rather than try to write stuff and link it together for a blog… not that I ever really write anything coherently…. I’m just going to throw stuff out there and here it is… oh and Happy Cinco de Mayo everyone! meal, I still have high hopes for their food. It’s apparently a chain like Chipotle and it’s headquartered in Lancaster, PA. Everyone knows the Amish are experts in Mexican cuisine. Check out their website here. Size didn’t matter to Hamptonites! A $5 Footlong Fiasco – Subway in Water Mill is no more…. it recently closed it’s doors at the most cursed location on the East End. You know the one where there was once a Citarella, Blockbuster, Video, Water Mill Cupcake, Foody’s, Avanti and Muse among others. Apparently nobody cares about size in the Hamptons…. LOL! NOT!I don’t normally stop and take photos but this scene on the corner of Stephen Hands Path and 114 in East Hampton just jumped out at me. What do you think this picture is saying? Patriotic decorating in the Hamptons! An innovative high school design! Lisa Perry’s never ending senior high school home economics project is coming to East Hampton. I guess if anyone has enough money they can take liberties with the word “style.” This beautiful ditty to the left which just screams fashion sense is now available on E-bay! No, YOU have to pay THEM! They go lightly in the night! Speaking of style… somewhere the stylish Audrey Hepburn is shedding a tear. The Tiffany and Company on Main Street is no more! Apparently they went lightly one night a few weeks ago. Sadly, there will be no Breakfast at Tiffany’s in the Hamptons you’ll instead how to go to London Jewelers … “Breakfast at London Jewelers”… hmmmmmm…. not as catchy! Finally, is it just me but does driving along Route 27 feel a lot like playing the old video game Frogger?! Maybe we can make this into an actual game avoid a big hole and get 100 points… medium 50 points… small 10! ?